When the first telescopes were pointed towards the heavens, they did not sit atop complex mounts that align with the Earth’s axis such as the English Yoke or German Equatorial. Those original, simple mounts offered two axes of movement, altitude and azimuth, and are now colloquially known as Alt-Az with perhaps the most famous being the Dobsonian which brought about a revolution of large aperture Newtonian telescopes in the amateur astronomy community. My first scope was a 4.5” Newtonian mounted on a (shaky) German Equatorial. While for visual astronomy a precise polar alignment is not necessary, it does not really qualify as grab and go mount for quick looks when a 30 minute gap in the clouds appears. Though the 4.5” opened up the heavens and ushered in a lifelong passion for astronomy, aperture fever soon took hold and my first upgrade was an 8” Newtonian on a small, but silky smooth Alt-Az. From that moment on I was hooked and I eschewed equatorials in favour of the simplicity of Alt-Az. Today I own 6 telescopes and numerous mounts and there is not an equatorial among them. 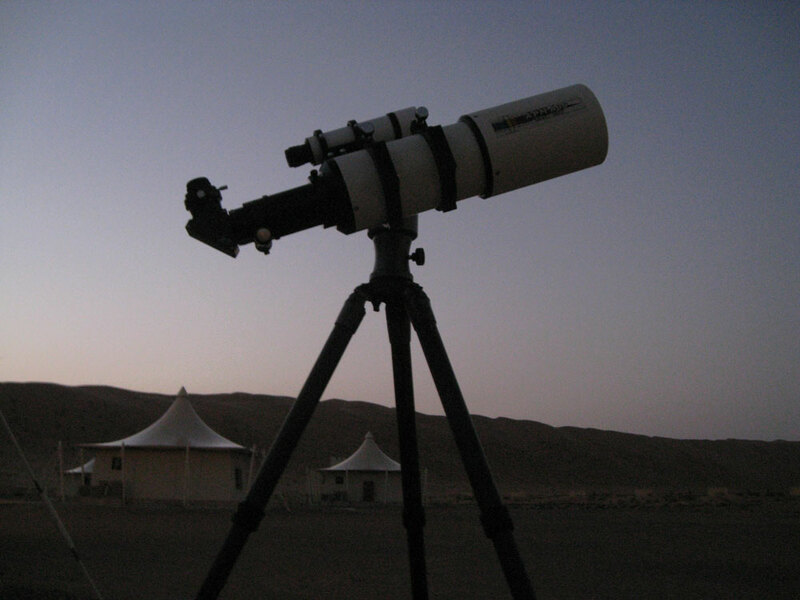 After booking a two week holiday in Oman in 2012 which included several nights in the desert, hundreds of kilometres from any substantial settlements (and light pollution) I began putting together an airline portable setup that would allow me to take advantage of those precious dark skies. I selected the APM TMB 105/650 triplet apo (you can read the review here) as my OTA which will fit inside a cabin bag and after much deliberation the carbon fibre Gitzo GT5532s tripod (you can read that review here) which has proved to be a light-weight but very rigid solution to the problem of finding a tripod which fits in my suitcase but does not consume large quantities of the weight allowance. Consideration of limited airline baggage allowance was crucial. I could not afford heavy counterweights in my suitcase. The hunt was on for an Alt Az mount which would comfortably hold an OTA with rings, finder, diagonal and eyepieces which tips the scales at around 7kg (15.4lbs). After speaking with Marcus Ludes at APM telescopes in Germany, he recommended the Tele Optic Giro Ercole. The price was €379 excluding any dovetail clamps. The Tele Optic Ercole is wonderful machined and finished from a strong aluminium alloy. The Ercole is the flagship manual mount of the Tele-Optic range and it shows. This is very much German engineering at its finest. CNC manufactured from a strong aluminium alloy, the fit and finish is truly first class. Unlike many comparable models on the market, this unit is lubrication free relying on radial axial bearings to facilitate smooth movement of lateral loads. 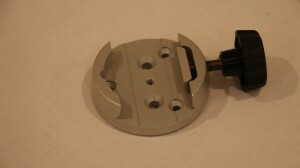 There are well sized variable tension knobs made of easy to grip plastic for each of the altitude and azimuth movements as well as an oversized lock on the top to prevent unbalancing when eyepieces are switched. My mount came drilled for the standard 3/8 tripod thread though the Ercole can be mounted on a wide variety of tripods. The Berlebach non-marring dovetail clamps are an excellent match for the Ercole. While stated load capacity of a mount never tells the whole story (moment of inertia is a crucial consideration) the Ercole can be used with an OTA of up to 8kg without the use of a counterweight and total capacity is 18kg per side, either as one large OTA and corresponding counterweights or as two side mounted OTAs for 36kg total. Most retailers including APM state the Ercole weighs 3kg but I measure it as 3.8kg. 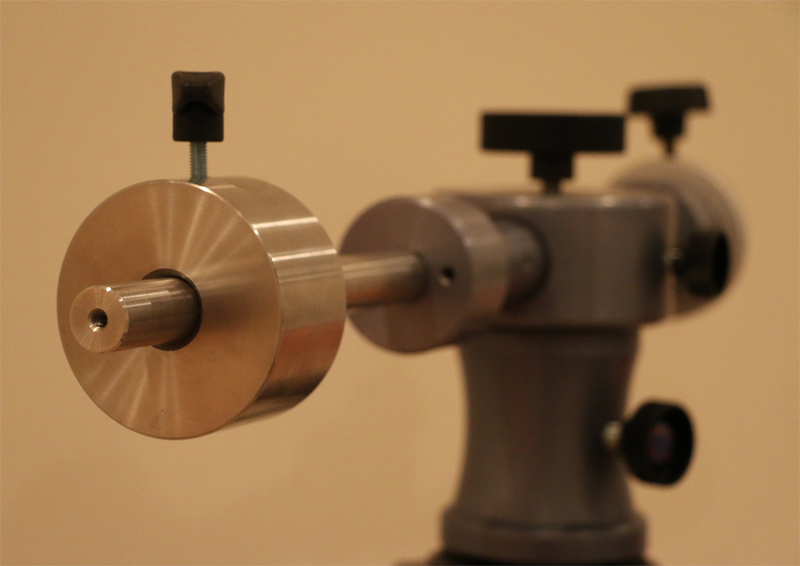 Each arm is drilled to accept the standard 20mm Skywatcher-fit counterweight shaft. Telescope attachment is via two M6 screws which can either directly fasten a mounting plate or as I do, attach a dovetail clamp. I use the non-marring Berlebach dovetail clamp with pressure shoe. One unit weighs approximately 200 grams which brings the total unit weight to 4kg for single OTA use. The clamp costs approximately €50 and certainly matches the finish and quality of the Ercole. My first extensive use of the Ercole occurred in Oman and I was immediately impressed with just how smooth the motion of the mount was with no backlash what so ever, as well as the ability to hold the OTA perfectly steady no matter the orientation. If one takes just a minute or two to balance the OTA before observing there is no need for the tension knobs to be tightened at all. Used like this, scanning the sky is an absolute joy and mount just gets out of the way. The APM105 and Ercole at sunrise after a memorable nights observing at the Desert Night Camp in Oman. On one night in Oman, I was presented with the steadiest skies I have ever had the fortune to observe under. With Jupiter passing within ten degrees of the zenith (a notoriously difficult region of the sky for Alt-Az to cover smoothly) I took the magnification up to 216x (3mm setting on the Nagler Zoom EP) and found that with just a modest amount of tightening of the tension knobs I was able to smoothly track Jupiter despite the lack of slow motion controls. Travelling light, I had no barlow with me but I believe that not only would the sky conditions have allowed a much higher magnification, the Ercole would have as well. I now regularly use the mount with magnifications of 150 to 200x and always find keeping the object of interest centred a effortless task. A little party trick of mine is to manually track the International Space Station across the sky. I typically do this in the magnification range of 70-100x. With the tension knobs loosened and the scope well balanced, it is a simple job to keep the station centred in the eyepiece, revealing a substantial amount of detail. To my (slightly geeky) eye, the station resembles a Tie-Fighter from Star Wars, with the large solar arrays flanking the main station body, as it silently soars across the sky. This is a rather stern test of the smoothness of rapid panning and is one that the Ercole passes with ease. The shootout at Astrocamp. Two four inch class triplets were easily handled by the Ercole. The success of my astronomy adventures in Oman meant that it was quite some time before I used a counterweight with the mount. 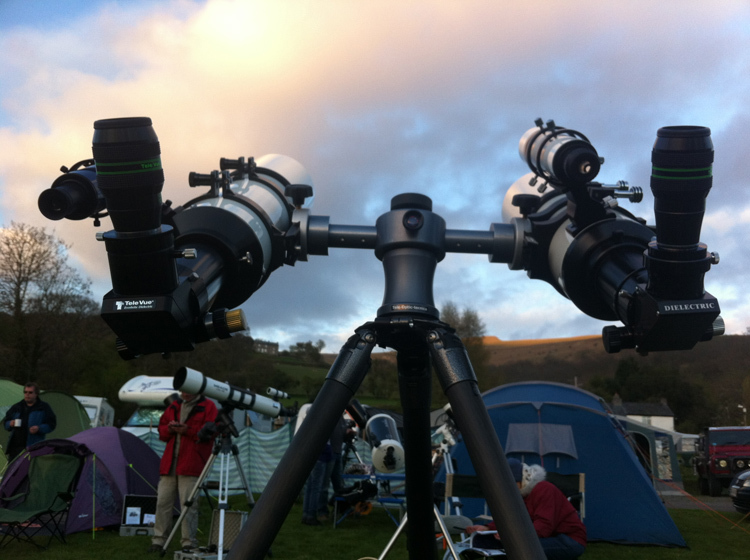 That counterweight happened to be my TMB 115 apo when I conducted a shootout at AstroCamp in the Brecon Beacons in Wales between both refractors. It was a revelation. The motion of the Ercole had always been buttery smooth, but the addition of a weight on the other arm took to a whole other level. The movement is as smooth as any mount I have ever used. If I have the capacity to carry a counterweight on my astronomy travels, I will take one but if I am unable, it is great to know the mount will still perform wonderfully at 200x or more. One weakness of Alt-Az mounts is the loss of balance when switching eyepieces, especially when changing from a hefty 2” model to a small, lightweight 1.25”. The easy to grip, oversized locking knob means there is no need to worry about the OTA swinging widely while reaching for a new EP and if I am feeling a little too lazy to rebalance the OTA by sliding it in its tube rings, then a minor tightening of the altitude tension knob keeps any balance issues under control. While desert observing in shorts and a t-shirt in mid-20C temperatures is a rather pleasant experience, I have used the Ercole in freezing temperatures on multiple occasions in the UK. On one particularly frigid night a thin layer of ice had formed on the OTA and my eyepiece case by the time I called it a night. Yet the performance of the Ercole was not affected in any way. Lubricating grease seen in other mounts can harden on cold nights which results in stiff movement. The Ercole with its well engineered lubricant free bearings suffers from no such short comings. The process of aligning two OTAs on the mount is a straight forward one. Each arm is held in a position by two small hex bolts. A slight loosening of those bolts using an Allen Key allows for any minor adjustment to the altitude to bring both OTAs into line. I have found that both OTAs can be adjusted to within just a few arcminutes of each other. Having a narrow field, high power instrument alongside one that permits wonderful wide-field views allows for very complimentary viewing of many DSOs. The Tele Optic counterweights are wonderfully finished but are expensive compared to other brands. Over almost three years of ownership, a wide variety of OTAs have been mounted on the Ercole including 10” class SCTs and similar sized Newtonians though the most common OTAs to be found attached are my two 4” class triplet apos, the aforementioned APM 105 and my larger and longer 4.5” 115 f/7 TMB which fully kitted out exceeds 8kg (18lbs). The Ercole has always proved to be an excellent performer and more than up to the job. Even without slow motion controls, keeping an object of interest centred in the eyepiece at 200x is a simple task and with a balanced OTA, the smooth, swift motion allows for very enjoyable sweeping of the Milky Way. At around €370 for just the mount, it is not a cheap manual Alt-Az, but the engineering quality and finish is first rate, and the ability to hold an OTA of up to 8kg without counterweights makes it a great choice for the travelling astronomer. 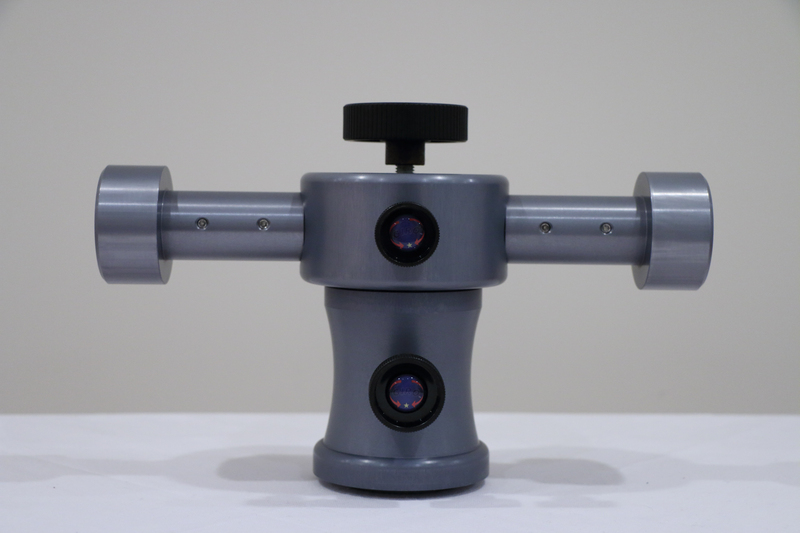 In addition, with a total capacity of 36kg (OTA plus counterweights) it can double up as a mount for less transportable scopes used closer to home. The Tele Optic Giro Ercole is highly recommended. Tagged Alt Az Mount, Heavy Duty, high load capacity, No counterweights, review, smooth panning, Tele Optic Ercole. Thank you for the review. I have used an Ercole just over 2 years and it supports a 120 mm triplet (and counterweight) with ease. But what are your thoughts about this mount supporting telescopes that are a little heftier and have longer torque arms? For example, a 11-12 kg refractor that is 1200 mm long, such as the APM 152/1200 ED. Have you any experience with this? I know some astronomers who use scopes as long as the 152/1200 but perhaps not quite as heavy which would reduce the moment arm but they all report excellent performance. Given the scopes I know that have been used with an Ercole, I would be quite confident it could handle something in this size and weight class, but the tripod would need to be a bit more beefy that one that might be used with a smaller scope, otherwise the vibrations at high power might become a point of frustration.